Walking offers many benefits for your diabetes and blood sugar control. It is one of the most relaxing and easiest forms of exercises to do. And for weight loss purposes, it is about the best thing you can do. Walking is also a low-impact aerobic activity that burns a lot of calories in a relatively short period of time. Another positive factor is that walking is a low-injury risk. All you need is a good pair of walking sneakers and you are on your way to great fitness. 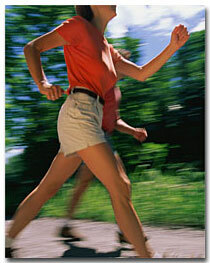 Cardiovascular health is also improved along with your blood sugar control. Other areas that are greatly improved by your walking is blood pressure and cholesterol levels. As a result, it will help you live a longer healthier life. People have stress, but especially those with diabetes. Walking is one exercise that greatly decreases the levels of stress, and give you a great uplift in your mood. It gives you a chance to think and work out problems as you are walking. And by the time you are through, you are better able to deal with situations with clearer thinking. I find this true of myself. I think I've solved more problems while walking then anything else! To motivate yourself to walk more and further, buying a pedometer is a great tool. Most pedometers tell you how far you have walked, how many steps, and calories burned. I have found over the years that it is a great weight loss tool. If the weather is too warm, you can always mall-walk. I have done this for years and there is nothing better than a nice comfortable environment to walk in. I have made a lot of friends that way by taking morning walks in the mall too. So to improve your overall health, get out and walk a little bit each day. In the long run, you'll feel better in many ways! Can exercise on treadmill help manage your diabetes? Treadmill exercise is a cardio workout which the best exercise to stay fit and healthy, is easy and low impact, just walking 10 to 20 minutes a day can help you manage your diabetes and improve your fitness level to learn more Click here. Learn ankle exercises, knee exercises, hip exercises and leg exercises and get leg workout and running tips. The Cretan Bowl Diet - is an easy weight loss diet based on the healthy Cretan and Mediterranean Diets. It’s a simple and easy to follow no-fad slimming diet to help you lose weight quickly and safely, and will improve general health and promote long life too! What do you do for exercise? Tell Us! Share with others what you do for exercise or write an article on the benefits of different exercises.